We've said a lot of nasty things about Johnny Depp, Tim Burton and their upcoming film, "Dark Shadows." So now that we've seen the first trailer, we'd like to take this opportunity to say we're sorry and admit that it looks great. "Dark Shadows" was a cult hit in the '70s, a vampire soap opera that ran for five years, about a family that lives in a mansion atop a hill on the coast of Maine. When it was announced that Burton and Depp would be teaming up for a film adaptation, it elicited a deep sigh and some eye-rolling resignation. Here we go again... they're gonna take something kinda creepy and make it creepier still and gob it up and... oh lord, please stop." But the trailer looks, great. It's definitely Burton, but not archly so, more evocative of his "Sleepy Hollow" palette. And Depp appears to be bringing some real swing to the part of Barnabas, the back-from-the-dead vampire who finds himself again in a torrid love-hate relationship with the evil witch Angelique Bouchard, played by Eva Green. Rounding out the cast are Helena Bonham-Carter (of course), Jackie Earle Haley, Michelle Pfieiffer and Chloe Grace Moretz. 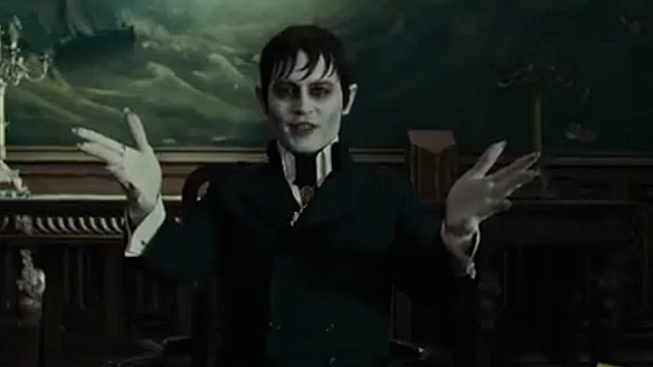 "Dark Shadows" opens May 11, and we are totally on-board.